44 years, 6 months, 7 days old age. Ram will turn 45 on 11 October, 2019. Only 5 months, 22 days, 4 hours, 11 minutes has left for his next birthday. Ram has celebrated the total number of 44 birthdays till date. See the analysis by days count and bar graph. Ram was born on 11-10-1974 in Chennai in the state of Tamil Nadu, India. He is an Indian Film Director & Film Actor who known for his work in Tamil film industry. Ram started writing the short stories in his mother tongue Tamil during the time he was pursuing his "Master of Arts" in Tamil literature from the "Madras Christian College". He was recommended by someone to approach ace director Raj Kumar Santoshi to pursue a career in Hindi films. He began working with Rajkumar Santoshi from the movies Pukar-2000 and also Lajja-2001. Despite his help, the story of Lajja could reach on the finish line. In 2006, he made debut as a director from the film Tamil M.A. whose name changed to Kattradhu Thamizh. In addition, the movie was exempted from the entertainment tax. This film depicted the life of a young man, who was struggling to run his life due to his education. He offered the lead role to actor Jeeva because he was impressed by seeing his performance in the film "Raam in 2005".The film shot in the different states of India over a year such as Kerala, Maharashtra, Chennai, and Andhra Pradesh. On the completion of the shooting film gained the higher expectation. Kattradhu Thamizh exhibited the struggling phase of a person who holds the post graduation degree in Tamil, but due to his education, he could not find the job anywhere. He disappointed by the biasing in the social delamination. The film released on October 2007 and gained high critical praise. In the mid-term of the year 2009, he was willing to pen down another story, and he gave a name to this project Thanga Meengal. The story of the film portrayed the life of an ordinary man, whose life is wrapped and changed by today’s educational system as well as globalisation. This film was counted as the big commercial hit and also had the significant success at the box office along with best critics acclaiming. 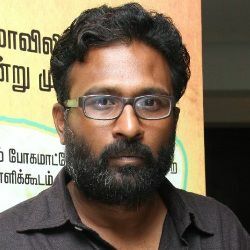 Thanga Meengal won three times the "National Film Awards" and so many prestigious awards. It was the only Tamil language movie got selected to "Indian Prospect in IFFI (Goa). He started his next project after enjoying the success of Thanga Meengal in 2014 was Taramani that administers with modern relationships. On 11Aug 2017, this film was released and on the releasing it started gaining the rave-reviews from the critics and also the audiences reviews and counted as the hit film at the box office. His 2016 released film "Peranbu" starring Sadhana and Mammotty was rated as the must-watch-20 films at the 2018 IFFR by VPRO ( is a leading publishing company in the Netherlands). He was born to Murali Pothineni and Padmasree Pothineni. He has two brothers named Sravanthi Ravi Kishore, a film producer, and Madhu Smitha Pothineni.